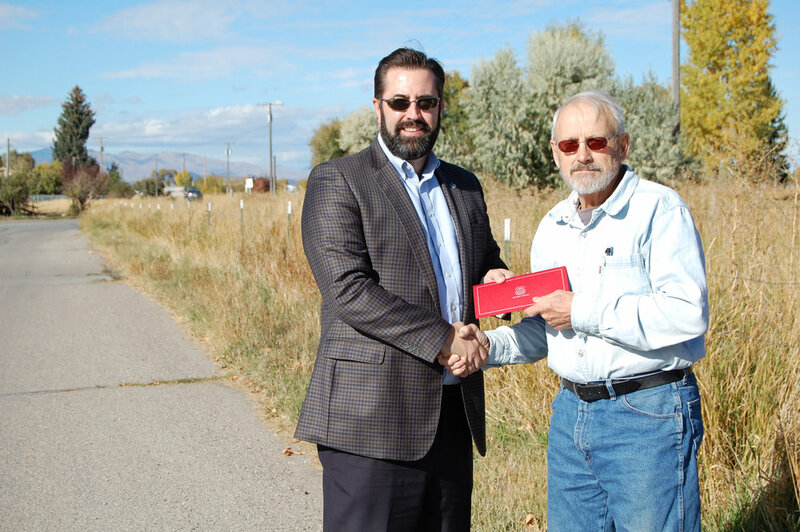 Beaverhead Trails Coalition BTC receives the Union Pacific Award! BTC receives the Union Pacific Award! BTC board member Ed Mooney and Executive Director Celine Beaucamp-Stout met with M. Nathan Anderson from Union Pacific to receive the $5,000 award in person and show M. Anderson the project location. The grant will go toward the construction of the Noble Avenue Connector Trail. The Noble Avenue Connector Trail will be built in 3 sections: the northern and southern portions will be dirt trails around running water and re-vegetated pocket parks; the middle portion where easement is not wide enough for a separate trail, will be built as a road-side lane by the City of Dillon. The expected completion date is 2020. The goal is to connect the Laknar Lane Trail on the north side of Highway 41 to the downtown trails and the safe-routes-to-school system. Visit our page https://www.beaverheadtrails.org/trail-connectivity/ to learn more about this exciting project. Thank you Union Pacific for your support to our community! Newer PostBTC was at the Chamber Of Commerce Halloween Party!